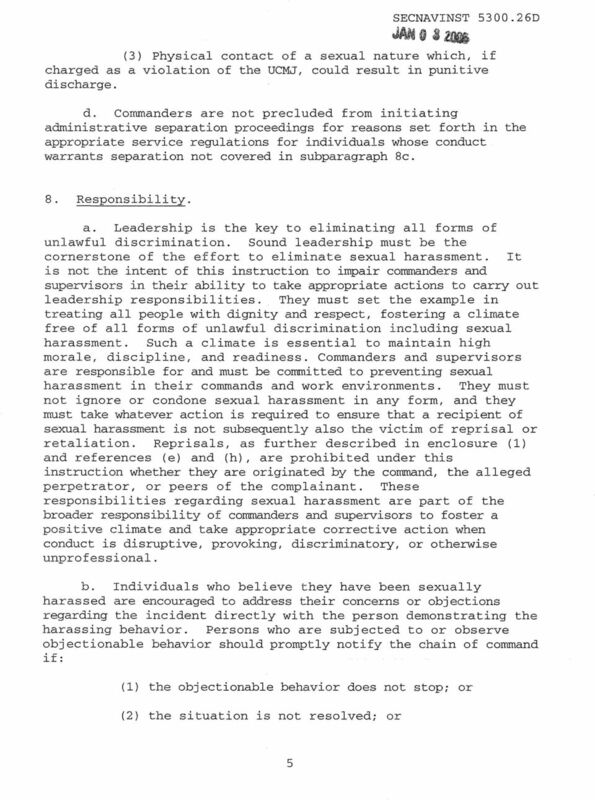 Download "DEPARTMENT OF THE NAVY OFFICE OF THE SECRETARY 1000 NAVY PENTAGON WASHINGTON, D.C. 20350-1000"
1 DEPARTMENT OF THE NAVY OFFICE OF THE SECRETARY 1000 NAVY PENTAGON WASHINGTON, D.C SECNAVINST D ASN(M&RA) SECNAV INSTRUCTION D JAN From: Secretary of the Navy Subj : DEPARTMENT OF THE NAVY (DON) POLICY ON SEXUAL HARASSMENT Ref: (a) (b) (c) (d) (e) (f) (g) (h) (i) Encl: DOD Directive of 18 Aug 95 DOD Directive of 21 May C.F.R (NOTAL) Title VII of the Civil Rights Act of 1964, as amended 42 U.S.C. 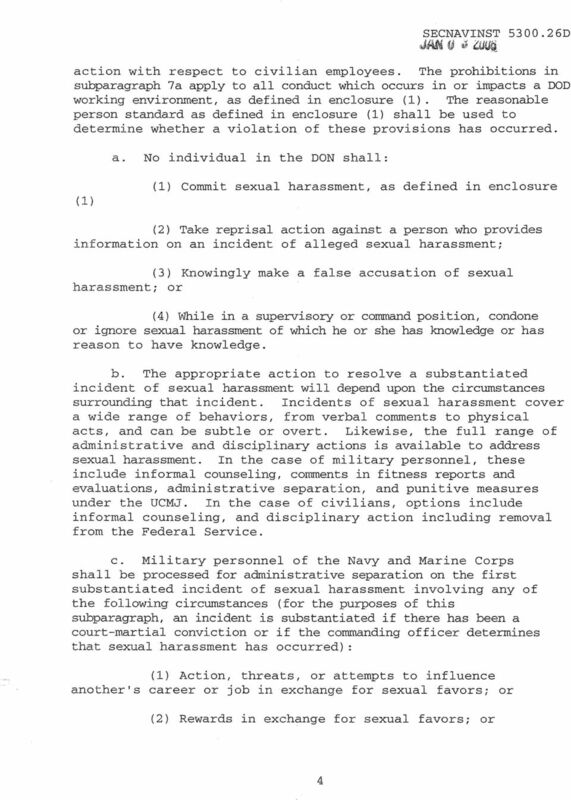 2000e (NOTAL) DOD Directive of 23 Jun 00 NAVPERS SECNAVINST OCPMINST A (NOTAL) OPNAVINST E (1) Definitions (2) Range of Behaviors which Constitute Sexual Harassment 1. Purpose. 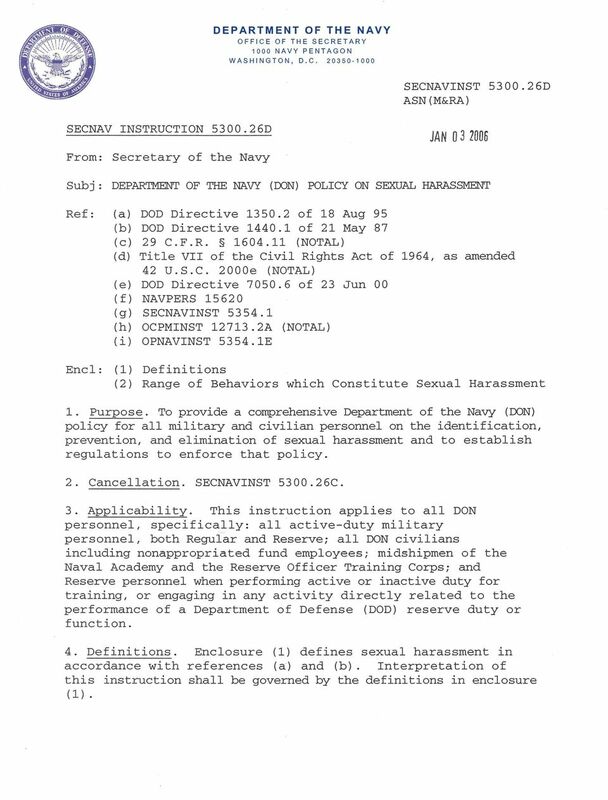 To provide a comprehensive Department of the Navy (DON) policy for all military and civilian personnel on the identification, prevention, and elimination of sexual harassment and to establish regulations to enforce that policy. 2. Cancellation. SECNAVINST C. 3. Applicability. 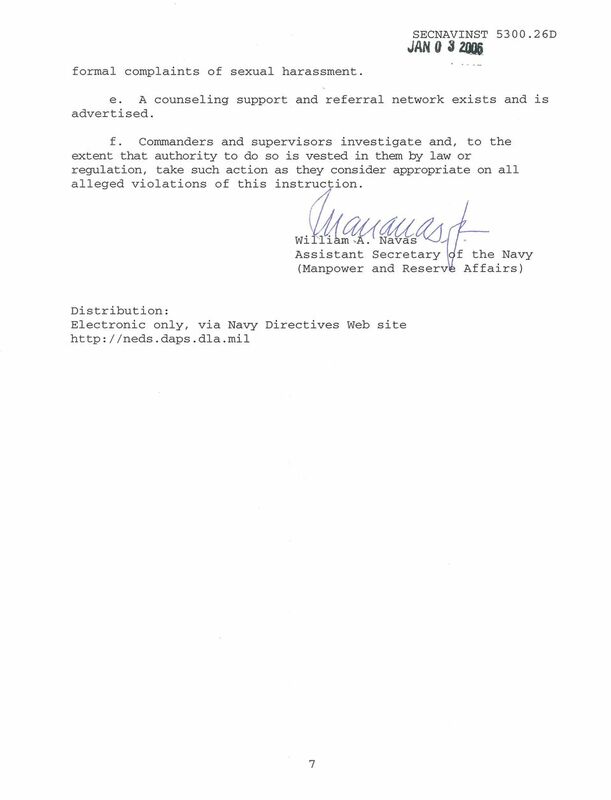 This instruction applies to all DON personnel, specifically: all active-duty military personnel, both Regular and Reserve; all DON civilians including nonappropriated fund employees; midshipmen of the Naval Academy and the Reserve Officer Training Corps; and Reserve personnel when performing active or inactive duty for training, or engaging in any activity directly related to the performance of a Department of Defense (DOD) reserve duty or function. 4. Definitions. 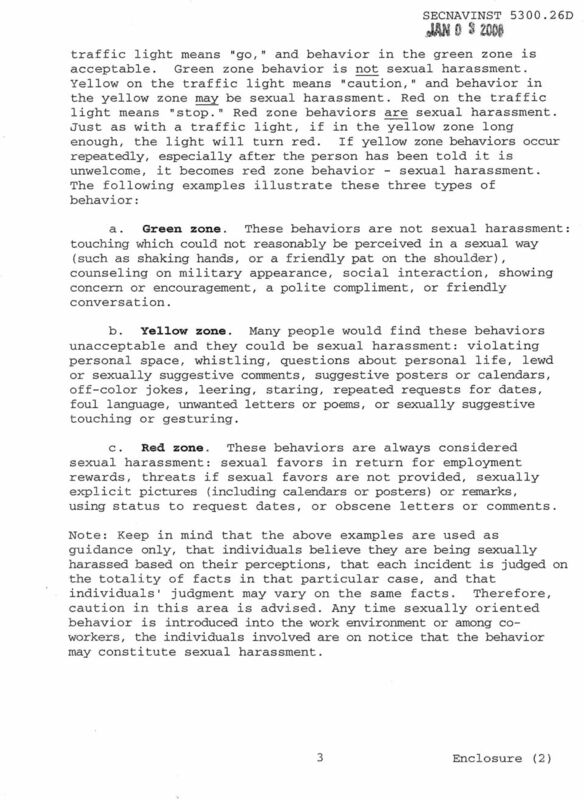 Enclosure (1) defines sexual harassment in accordance with references (a) and (b). Interpretation of this instruction shall be governed by the definitions in enclosure ( 1). 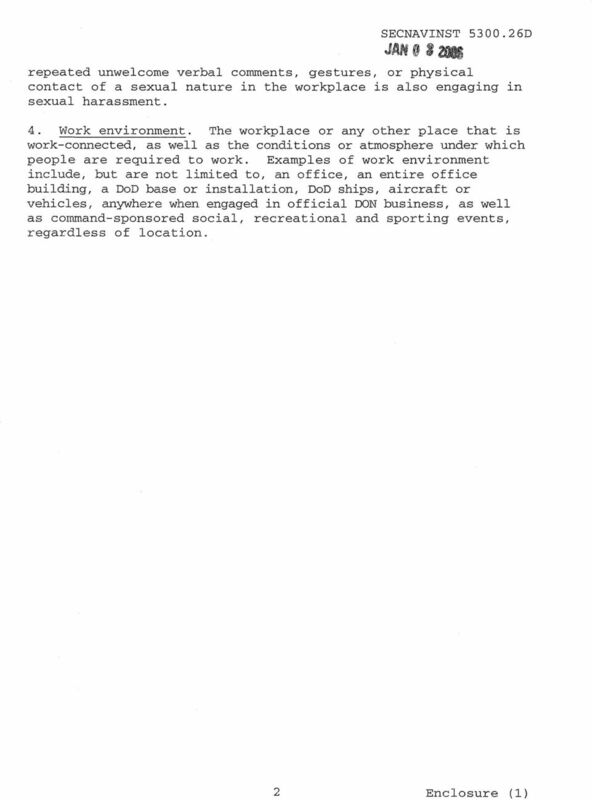 EMPLOYER S LIABILITY FOR SEXUAL HARASSMENT BY SUPERVISORS. Charges of Sexual Harassment Are a Small Business Nightmare Statistics Bare This Out. The State of Sexual Harassment in America: What is the Status of Sexual Harassment in the US Workplace Today? Like federal and state laws, the information in this booklet is gender neutral and applies equally to men and women.